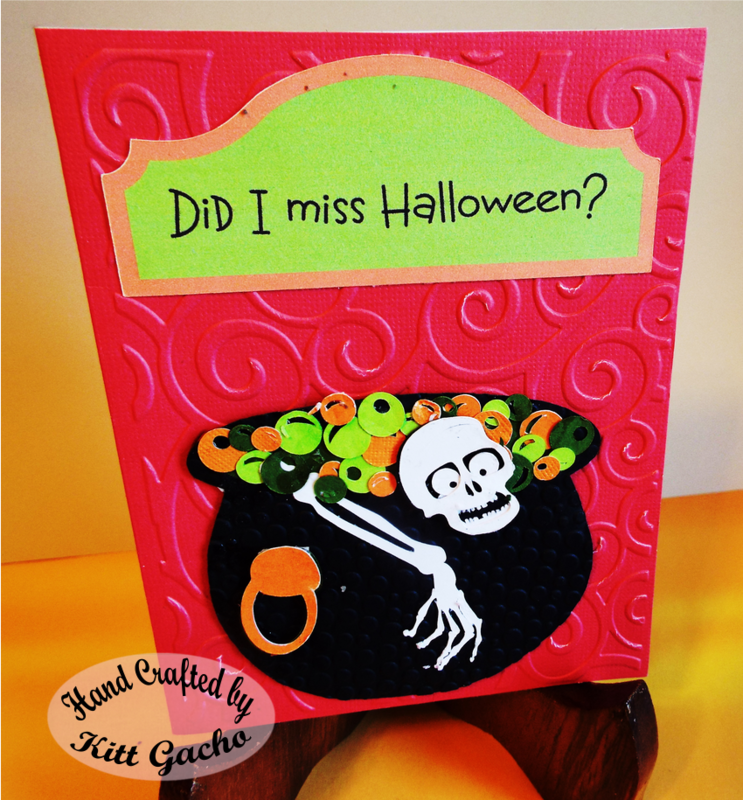 Kitt's World: Last Halloween project this year. I promise. 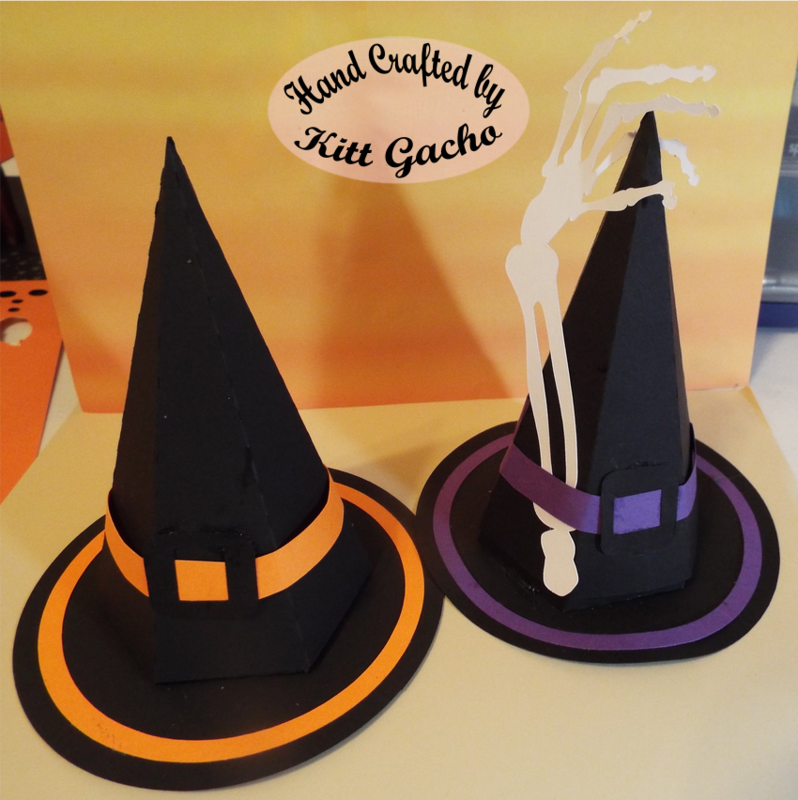 I had to make an addition to the PURPLE WITCH TREAT HAT. A skeleton arm of course. LOL. I also made one more with the traditional orange trimmings. Okay, I know I said I may have one more Halloween project in me. This image is from the Silhouette Store. And it just says Whew! we made it to Halloween. 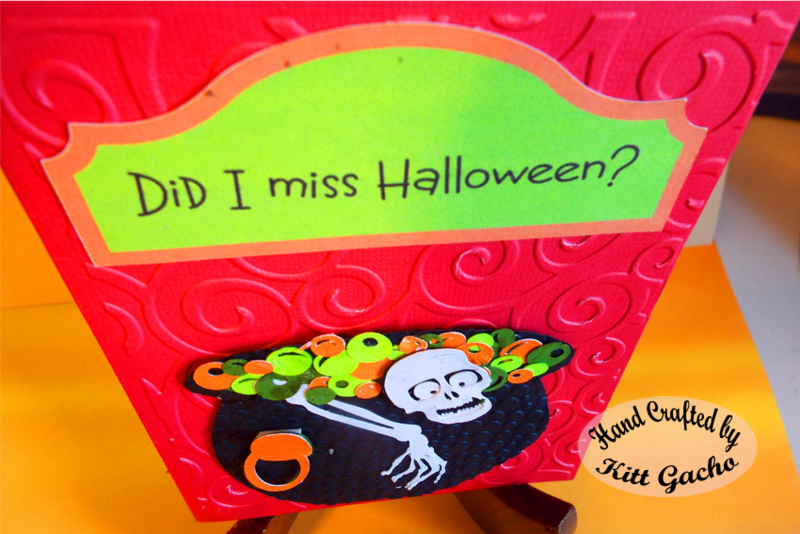 I used the cuttlebug embossing folder Bubbles for the cauldron and the Cuttlebug Swirls embossing folder for the base of the card. I used the Silhouette to print and cut the sentiment and skeleton. Have I told you how much I love my Silhouette Cameo lately? I will have some Thanksgiving projects coming soon. Actually, I have one that is ready but it is for a challenge that is not due until Nov. 11th. I'm already thinking I've got to get those Christmas projects going too. Follow me as we start down the Holiday count down to Christmas. Thanks for your comments. I love hearing from you Have a happy and safe Halloween. Kitt these are fab and great. We so appreciate you're sharing your project & creativity at 613 Ave C Kitt! That's a really cute idea and a darling sentiment to go with it! Nicely done! Fab project. Thanks for joining us at Dream Valley Challenges. Cute and clever card!! hanks for joining us for "Anything Goes" at Creative Cutting Challenge. The hats are fantastic!! And so is the card! Love the embossing the die cuts.. Just fantastic!! Thanks so much for playing along with us at Open-Minded Crafting Fun Challenges!!! Good Luck! I hope we see you again!! That card is sooooo fun!!!! And love the hats of course!